We know that Mother Nature can sometimes be slightly uncooperative. In these instances, try not to get too depressed. In addition to pristine beaches and what have been (dare we say) Caribbean-like waters this summer, Long Beach Island is chock-full of awesome shopping destinations! From Schooner’s Wharf and Bay Village in Beach Haven to the historic Viking Village in Barnegat Light, you have plenty of options to get your shop on! And don’t forget to take that wonderfully FREE LBI shuttle in between destinations. Hassle-free. What more can you ask for? From the Sink’r’Swim shops to SeaWall Artifacts, the Good Life and School of Vintage. Surf Shops more your style? From the historic Ron Jon’s to Surf Unlimited, Brighton Beach Surf Shop, Wave Hog and Faria’s too. No matter what your shopping pleasure, LBI has something to offer you! 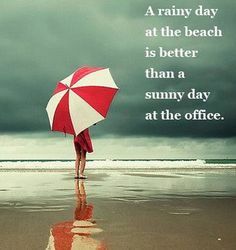 And remember…a rainy day at the beach is better than any day at work!